This book, like Carlin's other title that I have read, When Will Jesus Bring the Pork Chops?, is simply a place for his stuff. 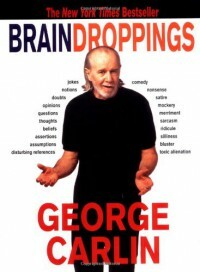 Most of the stuff, in fact, that Carlin had floating around on Word Documents at the time he compiled this book seems to find its way between the covers of Brain Droppings. Some of it is grade-A Carlin. The rest falls into the advertised category on the book’s cover: “bluster” and “silliness.” Carlin would have been better served had he edited these ingredients from his book. Even some of the better material already appears in his standup albums. If anything with Carlin’s name on it makes your fingers itch, then you will not need me to recommend this book. If you have heard the man’s name and would like to experience something truly great, I would recommend skipping this, and watching or listening to his standup material. Many novelists, playwrights, and filmmakers set their sights on humanizing historical titans through mediums more easily digestible to an average reader or viewer. They produce historical fiction light on history and heavy on middling or inferior fiction (usually scandalous exposés, or milquetoast schmaltz). These works of pop historical fiction peddle an understandable voyeuristic pleasure. We all want to see the man behind the curtain, the living, breathing subject who sat for the portrait. But rather than providing a fuller understanding of the history that feels needlessly cold and inaccessible, mostly these works provide a more impoverished portrait of their subjects than existed before. The figures they meant to flesh out come across possessing the dimension of a celebrity in a retrospective tabloid. Not all books, plays, and films in this vein are unreadable or unwatchable, but if dimension and complexity are what you seek, you cannot always avoid something ponderous. Tolstoy's laboriously constructed account of Napoleon's Russian invasion supplies that humanizing element sought after, but rarely found, in popular biographies. He treats Napoleon, Alexander, and Kutuzov with an irreverence bordering on satire, but rarely indulges in outright scorn. He weaves into the stories of these historical men the journeys of his fictitious creations, punctuating the whole thing with a long-winded treatise on historiography. To journey inside the minds of Tolstoy’s characters, both fictional and nonfictional, is dizzying but rewarding. More than any author I have yet encountered, Tolstoy captures not just the diversity between multiple psyches, but the profuse and fickle desires that battle constantly inside each individual mind. Tolstoy’s polemical passages criticizing 19th century historians are where the novel’s long-windedness seems unjustified. After just about every notable battle or diplomatic exchange Tolstoy expounds on the simple-minded views of historians who break down history into no more than events resulting from the wills of a few great men. These great men, Tolstoy reminds us, are subject to forces beyond their control just like anyone else, and the course of history is not one that can be preemptively mapped out by anyone. The argument is a solid and still relevant one, but each time he brings it up he adds precious little that has not already been said. He merely points out how the flaws he lays out early on apply to each new situation. The most articulate and fully formed passages on the subject are saved for the epilogue, but by then the few new scraps Tolstoy leaves for us feel like a cheap reward for having followed his tirades for so long. 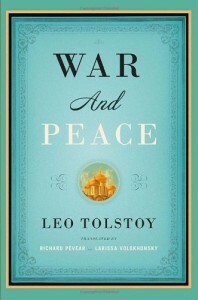 Nonetheless Tolstoy’s masterwork is worth the long hall. His beef with the state of historiography in his day, though long and rambling, is still articulate and accurate. Where the novel really shines is his characters. By acquainting oneself with Tolstoy’s Napoleon and Alexander, one really does see the men behind the curtain. Tolstoy strides boldly into the hearts and minds of these men and anyone who reads his book walks right behind him. What one finds inside is not an indecorous snapshot, but fully-formed kindred members of the human race. Andrew Barratt's book offers a helpful leg up to anyone who has an interest in Mikhail Bulgokov's famous novel, but has deficient knowledge of censorship in Stalinist Russia, the novel's literary and philosophical influences, the circumstances of its numerous publications, and the criticism written about it. Barratt offers much of his own thoughts on all of these subjects throughout the book, and it proves very insightful. 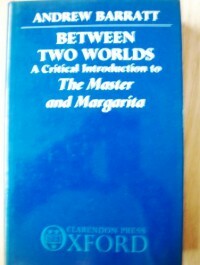 The Master and Margarita, a head-spinning cocktail of a book, has intoxicated many critics to such a degree that they speak of it in romanticized, and consequently very simplified terms. It's relevance to the age in which it was written has attracted zealous political animals who appropriate every facet of the novel for purely political interpretations. 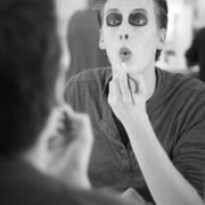 Its explicit indebtedness to Goethe's Faust has had many critics trying often unsuccessfully to tap into the characters' complex spiritual journeys. Barratt navigates these critical trends convincingly, lays out their weaknesses, and supplements them with his own insights. For anyone who has wanted to read the Master and Margarita, but has either been preemptively or retroactively baffled by its unconventional story and references to Soviet life, I would highly recommend this book.